The womb is a very loud, noisy environment, but the sounds heard within its cosy confines are consistent. Once born and away from all that, the new aural environment is often very unsettling for a newborn. As a result, the unfamiliar sounds of the world may make it difficult for them to fall and stay asleep. 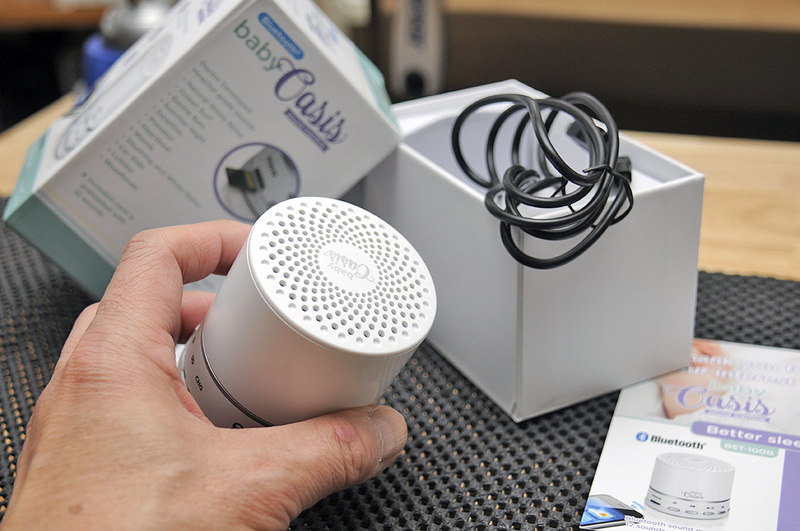 Sound Oasis’ BabyOasis device offers white noise and other sounds simulating those of the womb. These more familiar sounds help block out the sounds and stimulations that may be causing distress to the newborn. Sound Oasis is the world leader in sound therapy systems (otherwise known as “white noise” or sound machines). Their focus is all about helping people sleep, relax, or just enjoy more privacy. The BabyOasis unit leverages that sound therapy technology and makes it available to parents of babies and young children. Sound Oasis’ superior nature sounds are authentic, recorded-in-the-wild (or womb) sounds. 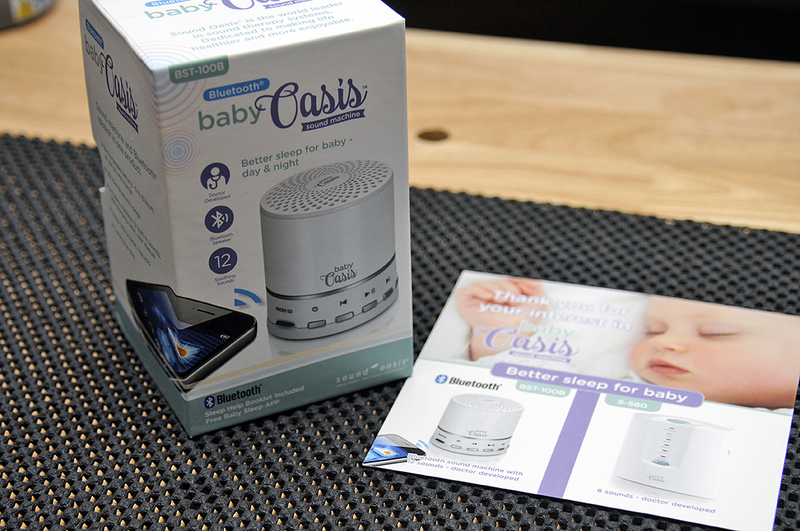 The BabyOasis comes with an SD card preloaded with those sounds to help create the ideal, peaceful, sleep environment for the baby. 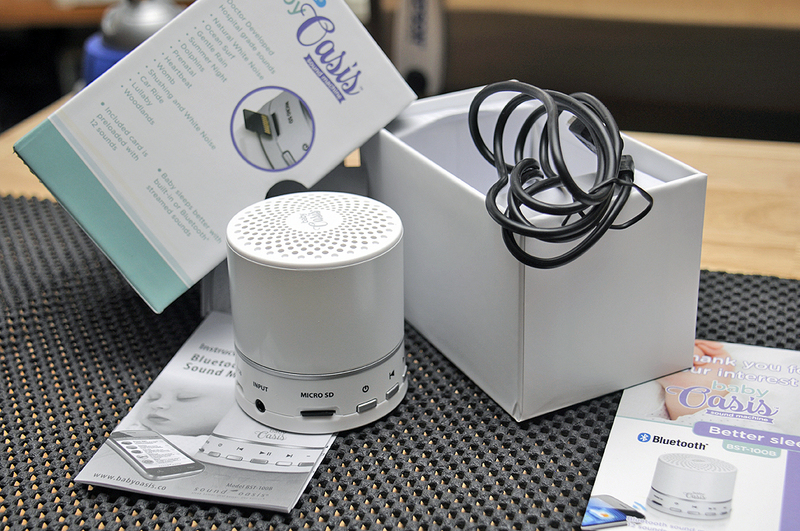 Along with what came in the package, there is an app, available for both Android and iOS, and a companion sleep help booklet, from Sound Oasis to help parents get the most out the device. The BabyOasis is small, very portable, and completely self-contained. The unit itself weighs 0.5 lbs and is powered by a rechargeable battery that can run for up to 8 hours of use on a charge. The controls for the BabyOasis ring the base of the unit, as does the ports and microSD card slot. The speaker is located at the top of the unit so it can project the sound in an omni-directional way. We have posted some FirstUse comments from our tester family and will follow up with them to see how the BabyOasis performs InTheWild. Look for it at the end of Fall/early Winter. “The most challenging parts for us as new parents is calming our son after baths and diaper changes (both things he seems to hate). We noticed that the mobile in his crib (spring actuated sound machine) seemed to help with this, but it required constant cranking. The BabyOasis sound machine has been a great addition. First and foremost, I am a big fan of the size and the portability. The sound quality is good. I love the seamless continuous play for the preloaded sounds (car ride and lullaby work the best for us). This little sound machine has become a necessity for us at night to help us calm him down and teach him that nighttime is for sleeping.